For fun, I will browse through the real estate sites looking at homes for sale located in places where I would like to live. “Down Maine” is one place where I’d be interested in living, if I had the means, the wherewithal, and the energy and cooperation of husband and dogs, to do it (all of which I have not!). Go have a look. And look through the photos of this little jewel. I know it’s tiny – that’s OK. I like small. Less to clean! But there is one important thing here with this adorable little bungalow, and that is the land. It comes with 35 acres of land! Thirty Five Acres? OMG, I want this property! You know I’m just daydreaming here, and I know it’s never going to happen for me. Paul is adamant that we live in this cottage until we both are no longer here, turned into ashes and dust. But dreams are almost as real to me as life. I dream every single night/morning (mostly I dream in the hours just before dawn which is when I finally get some brief sleep after lying awake all night). I daydream a lot, and I night-dream always. I can even be in a dream, wake up and have to pee, go to the loo, be totally awake and aware of what I’m doing, go back to bed, and as soon as my head hits the pillow, I can get back into that dream and go on for another hour in it. I do this almost every night/morning! Some days when I decide to go dream-househunting, I will pick Yorkshire to look at or maybe Liverpool (now that I’m obsessed with that city), or Cornwall where it’s much warmer all year. Oh, I’ve found some lovely places over there for sale that would be just right for us… if only I could bring my dogs and Paul with me. I can spend hours looking through those places thanks to this thing they call the world wide web. 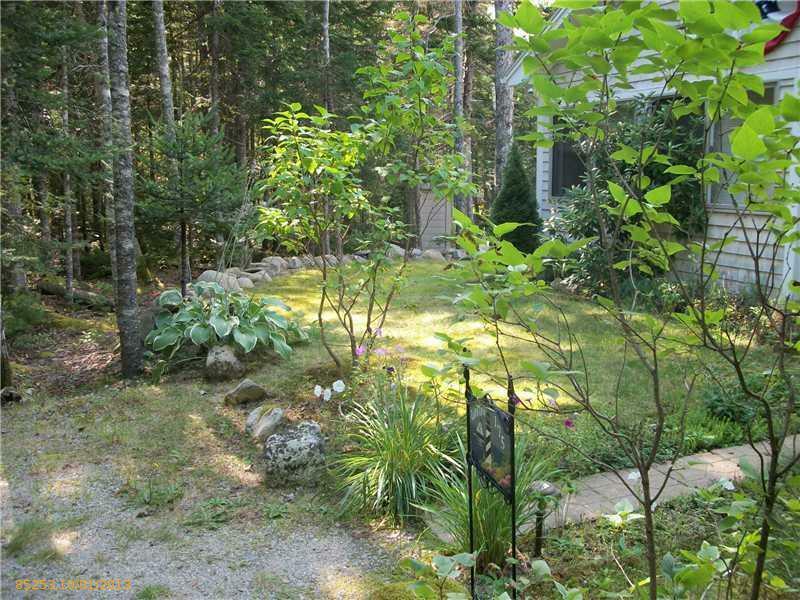 But this little bungalow/cottage/cabin/camp – whatever you call it – down Maine (and it’s really down there, too, not a quick little ride from here… probably 4-5 hours at least) is so perfect! However, I can’t even imagine sitting in a car for that long any more with my bad “everything”! Of course, if someone were to leave me a few million dollars, I could always take a small plane down there… maybe land in a clearing on my own property – heck with 35 acres, there’s plenty of space for a landing pad or runway! I don’t like small planes, however, and I really don’t like large planes, so that might not work. Oh well. I can dream. They haven’t banned dreaming yet and I sure hope they never do! Imagine if someone invented a google-chip that gets implanted into your brain at birth and any time your mind strayed off the track and went into dream-mode, you were reported and punished somehow? No dreaming? Nope… I wouldn’t want to live like that. 10 Responses to Down Maine – Heaven? I don’t dream shop much because in so many ways I’m living the dream. I love my home and the surrounding 6 acres that are all wooded and maintenance free for the most part. When I do dream shop, it’s somewhat reality based because someday I’ll be moving to be close to David & Olivia – somewhere in Virginia. About once each year I extend my dream shopping to Ireland. 🙂 Your dream home in Maine looks lovely. Paul has always had health insurance. We are both on Medicare now being “of that age” but he has had his insurance with the fisherman’s group until they decided to stop doing that several years ago (I was in under his policy but then they dropped everyone!). I had no insurance for a few years until I turned 65 (now 1.5 years ago) but now am covered under Medicare and supplemental as is Paul. He has no thyroid and needs to see doctors on a regular basis to even stay alive, so insurance for him is a must. Those little levothyroxine pills are all that are keeping him in the picture! I have vivid dreams too, especially in the morning, but they’re rarely good. Often they reinsert past loves into the mix and when I wake up, I am so thrilled that they are not real! I snuggle extra hard next to my guy and try hard not to pick up the dream again when I doze off. Hateful stuff. As for places to live — well, I hear you. I love my home, but I know also I have no choice. I’m tied to being close to my daughters, so I refuse to even consider moving. But all those acres! No! We have such trouble keeping three going! 35 is too much! Does Paul have health insurance these days? I envy you your night time dreaming. My dreams these days are always just disturbing jumbles. Never pleasant, never make any sense, never even properly scary, just chaotic. I guess I am lucky that they don’t pause and resume. Unlike you (and Mary!) I don’t window shop real estate. We are here until we’re no longer anywhere. We simply can’t afford to move. Well, theoretically we could afford to move, but we’re retirement age, we’ve got our little house (half the size of that Maine cottage) paid off and we’re not about to take on new expenses. But, yeah, the place is pretty much perfect and man, I’d love to have 35 acres. And Maine is beautiful. My parents lived in Tenants Harbor for years, quite a way down the coast from Surry, nearer to you. They were no ton the ocean but within sight of it. I am surprised at the prices of some of the houses around there. A lot cheaper than in this area (northeast Pennsylvania). Well, I’m sure we’re both better off staying put. I don’t like what you say about Paul, though. I hope you’re wrong.I worry about that myself since it is strong on my mom’s side of the family. Well, since I have no realistic hope of buying this house/land, I really don’t care if the porch is insulated or not. In my dreams about living in it, it never gets cold and it never snows so deep I am stuck. TT: The only way we could legally sell our house here would be if we spent big $’s having our entire yard and driveway dug up and a big pipe installed to connect our house to the city sewer pipes out in the street which were just installed there this past year up to our driveway. You cannot sell your house here if you are on a septic system (which we are) and if there is a hookup nearby for you to hook into from the city, which there is now. No way would we do that. It just cost our neighbors over $50,000 to do it because they wanted to buy the house their parents left them from their siblings… Paul would never go for it. And that’s just the selling part. It’s all I can do to go into the kitchen and make us dinner each night… that hurts me like hell now, so trying to move all our stuff out and down to Maine would be ludicrous. And Paul is going to be 70 next birthday and he has been showing signs of the big “A” disease that his dad has, so moving to the woods of Maine would not seem prudent for us with that in our future. No…it’s a dream for me but that’s it. Also, I think you have to be a resident of Maine for several years (? how many I’m not sure, 3 maybe?) before you can be issued a lobster license. Always fun to dream…maybe one day dream will come true. So, Paul could pull up anchor and lobster in Maine. They lobster in Maine, too. And since your house (being in Massachusetts) is worth about 3 times more than that little place in Maine, you’d have a nice fat nest egg to keep you warm on the days down the road when semi-retired Paul is too achey to take the boat out for lobsters. Bex, don’t just say ‘no one else will let me’ when it comes to things like this. You’re getting older and realistically your lives will be changing. It really is time to open up discussions as to changes you two could make to better your lives. DH and I are already bandying about things we could do with housing and all when we retire, and we’re still about a decade behind you and Paul. Charming little place! Thanks for sharing it. Small is good but 35 acres if left wild.we did the house on acreage and almost died trying to keep up the land. Our house is 925 sq. ft. but if we sit on half acre that is about it. First thing I thought of your dream house, is the sun porch insulated and heated for winter? lol We were up in Caribou Maine when we came here. Had to shovel our mobile out twice before leaving.